Dr. McCrea joined our team in August 2014. She is a native of Indiana who grew up in Fort Wayne. Dr. McCrea received her Bachelor of Arts in biology and studio art with high distinction from Indiana University in 2007. She graduated from Indiana University School of Dentistry, where she earned her Doctorate of Dental Surgery in 2011. 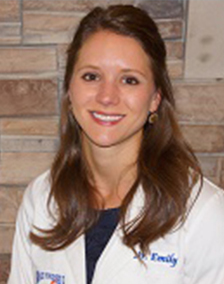 Following dental school, she completed a fellowship in orthodontics and received her orthodontic training and Master of Science at Indiana University. Dr. McCrea was excited to return to northern Indiana and become a part of Dr. Long’s office and friendly environment. She enjoys oil painting, snowboarding, and spending time with her husband Carter and their Bernese Mountain Dogs.